My top 5 are: Nip+Face Dragons Blood Cleansing Pads, Origins Ginzing Energy Boosting Moisturiser, Emma Hardie Age Support Eye Cream, Kiehl’s Daily Reviving Concentrate. Hydraluron Moisture Boosting Serum. 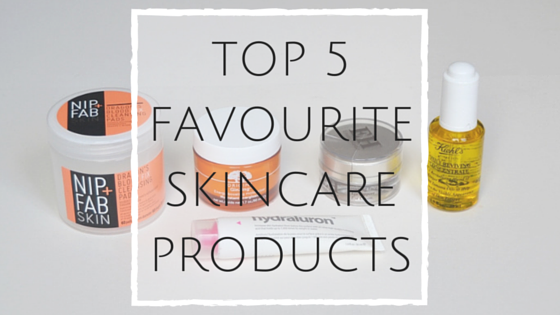 What are your Top 5 Favourite Skincare Products? Have you tried any of mine? OCC Cosmetics New Lip Tar Packaging! I havent actually used the moisture jelly how did you get on with it? Oh really? thats a shame i guess some products just dont work for some people? I actually picked up the Nip & Fab pads the other day and so far I’m really enjoying them. My skin has been so stressed with the travel and long days I’ve had in London for the last month and the pads are helping so much with hydration! I have combination skin too and also find it’s slightly more dry than oily during this time of year. I’ve never tried any of these products but the Nip&Fab dragons blood face pads sound lovely, I’ll definitely have a look out for these! This is an awesome list! The face cleanings pads sound really cool! Kiehl’s and Origins products are in my top skincare favorites as well! Thanks! i love Emma Hardie her products are amazing especially the eye cream Ill have to check that brand out always good supporting scottish talent!